In July of 1967, Disneyland opened a ride that not only showed a sliver of fantastic human ingenuity, but threw it in your face and screamed "Look at this! Look how awesome this is! This will change our way of life forever!" I'm talking, of course, about the one and only Peoplemover! You don't know what the Peoplemover is? Get out. Okay, fine. I'll tell you. It's basically a small train of cars gliding along a track, except the motors are in the track, not on the vehicles. The Disneyland Peoplemover's motors were tires that pushed the cars along as they went over them. But when they built the ride for the Magic Kingdom in Florida, the tires were replaced by magnetic linear induction motors, which effectively cut out all moving parts that could potentially break down. Part of the genius of the Peoplemover was that the trains never had to stop. The loading/unloading platform rotated at the same speed as the trains going around them, so what you're left with is a transportation system that would be really damn hard to break down and eats up the crowds like a stoned Hungry Hungry Hippo. Sounds great, right? So what did Disney do with it? Well, mostly nothing. 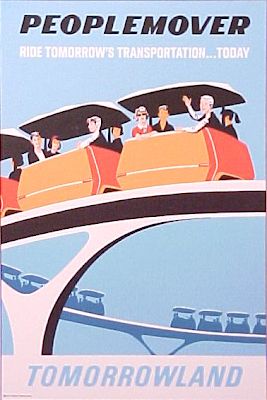 In 1995, Disneyland closed their Peoplemover to replace it with a steaming pile of crap called the Rocket Rods. Let's just say they failed miserably. I'll write about them later. Anyway, now Disneyland's Peoplemover track weaves around Tomorrowland, completely abandoned and just getting in the way while reminding people of yesterday's better tomorrow. The only places you can ride Disney's Peoplemover system today is at the Magic Kingdom and... George Bush Intercontinental Airport in Houston. That's not a joke. 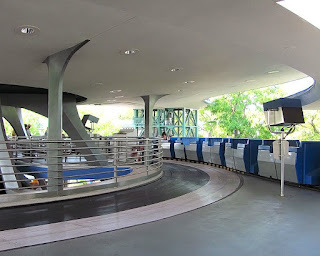 Disney built their inter terminal train, basing it off of the Peoplemover system. So there are practical applications of this system! What can be done with it?